In small bowl, mix ranch dressing and pickles. Cover and refrigerate sauce until ready to serve. In large bowl, mix melted butter, ground red pepper, brown sugar, salt, pepper, chili powder, garlic powder and smoked paprika. Place chicken in air fryer basket. Set to 350°F; cook 15 minutes, turning and stirring once. Transfer chicken to butter mixture in bowl; toss to coat. Return chicken to air fryer basket. Pour any remaining butter mixture over chicken. Set to 400°F; cook 12 to 15 minutes longer or until juice of chicken is clear when thickest part is cut to bone (at least 165°F), turning and stirring once. Serve with ranch dressing mixture. 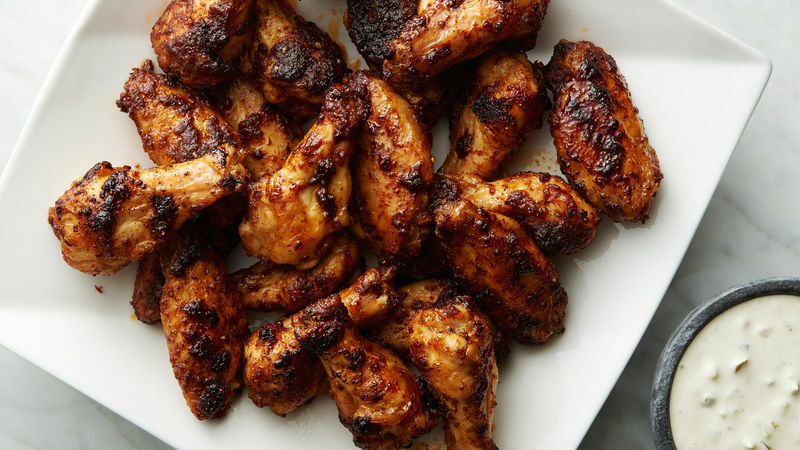 Look for precut wingettes and drummettes to skip the step of cutting whole chicken wings. Be careful when removing wings. Hot chicken fat will collect in the pan below the air fryer basket and can splatter if you shake the pan and basket together.